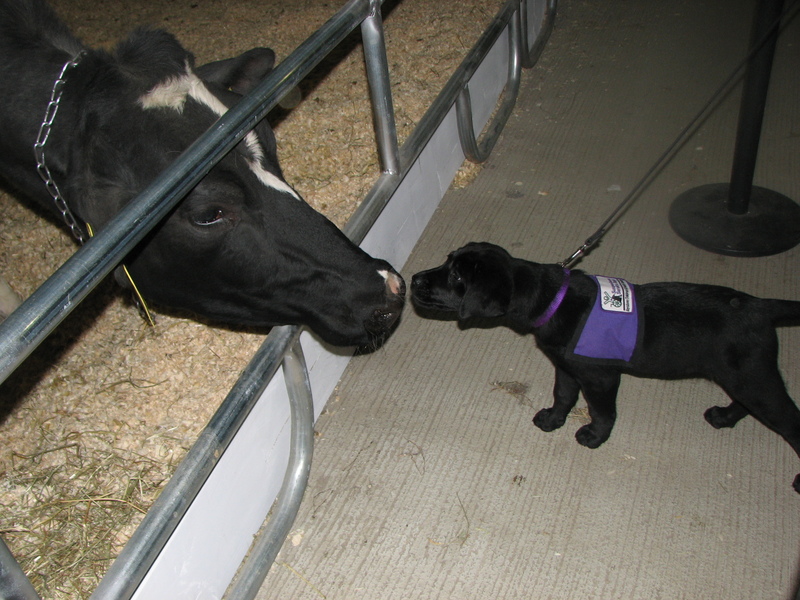 Celebrate International Assistance Dog Week! Did you know that there is an entire week devoted to assistance dogs? International Assistance Dog Week is coming up on August 5-11. We’re planning to share lots of great stories and photos with you about service dogs changing lives. Service dogs bond with their partners, and they often know exactly what their partners need, the way SSD Thunder has bonded with his partner Justin. “Thunder is so in tune with Justin’s emotions. The bond is phenomenal, one I will never understand. His mere presence has a calming effect on Justin,” says Justin’s mom, Laurie. 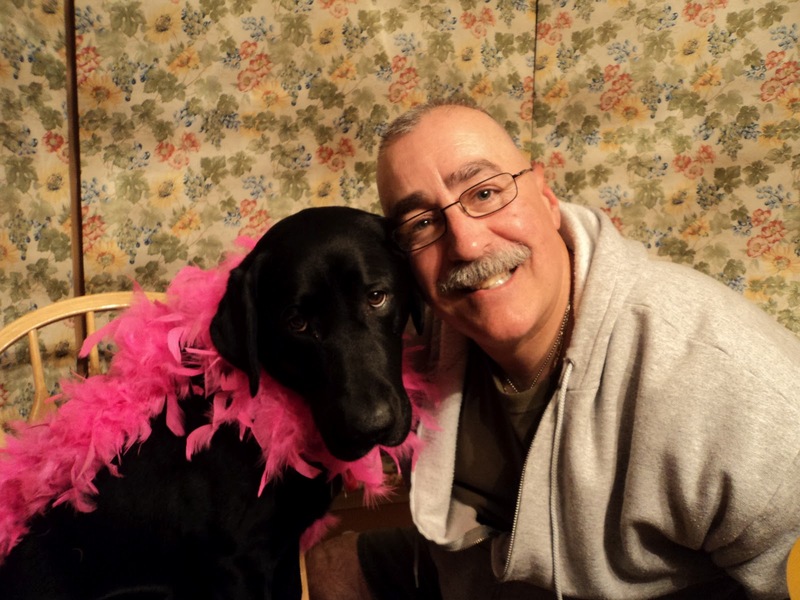 Justin’s parents decided to apply for a service dog after they saw what a positive effect SSD Scarlet, one of our facility dogs, had on him. During the 2009-2010 school year, Justin had a difficult time, escaping off of school property the first week of school and having violent outbursts. Although the school district did a wonderful job, Justin’s safety and the safety of others was becoming an issue. That January, his parents kept him home until they could find a safe place for him to go to school. That’s when they found the Capital Area Partial Program (CAPP), a program that provides professional therapeutic services to children and families. Justin’s parents were apprehensive about sending him to CAPP, but they knew he would be safe there. His mom knew they had found a good place for him when she picked him up on his first day of school. Justin came walking out of the building with a huge smile on his face, SSD Scarlet at his side. As Justin’s parents attended monthly meetings at the school, it became apparent that Scarlet was having a positive effect on him. However, they still worried that Justin would never be able to live a “normal” life. At a loss, they decided to look into getting him a service dog of his own. And that’s when Justin’s life began to change. They went through the application process – meeting with SSD Gideon and SSD Terra in the initial interview, and going through three therapy visits with SSD November – and in September 2010, they got the call to come to Meet the Dogs. At Meet the Dogs, Justin had the chance to meet and interact with several dogs in advanced training. But something happened when he met SSD Thunder. “I knew instantly that Justin would be matched with Thunder,” said Laurie. In November, Justin was officially matched with a dog, and at Team Training in February, the dog that trotted over to him was indeed Thunder. 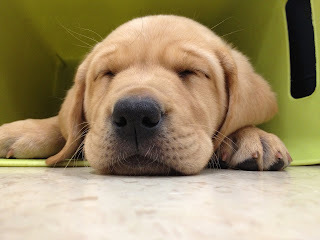 Team Training is exhausting because partners and their families are trying to learn everything they can about working with their new service dog in two and a half weeks. Four days into Team Training, Justin took Thunder home for the first time, and life has never been the same. Justin and Thunder are a perfect match. Thunder always wants to know where Justin is. If Justin is outside playing with the neighbors, Thunder sits in the yard or window and watches, his tail wagging. When Justin is having a good day, Thunder is always ready to play. When he is having a bad day, Thunder is willing to just hang out with him. Justin depends on Thunder when he is upset, always wanting to snuggle with him. “They’re like two peas in a pod,” said Laurie. 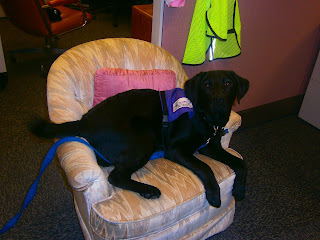 We get lots of questions from people in other states asking if there is an assistance dog organization in their area. We are more than happy to answer any questions you have, but we would also like to give you another resource to help you locate the highest quality service dog organizations near you. 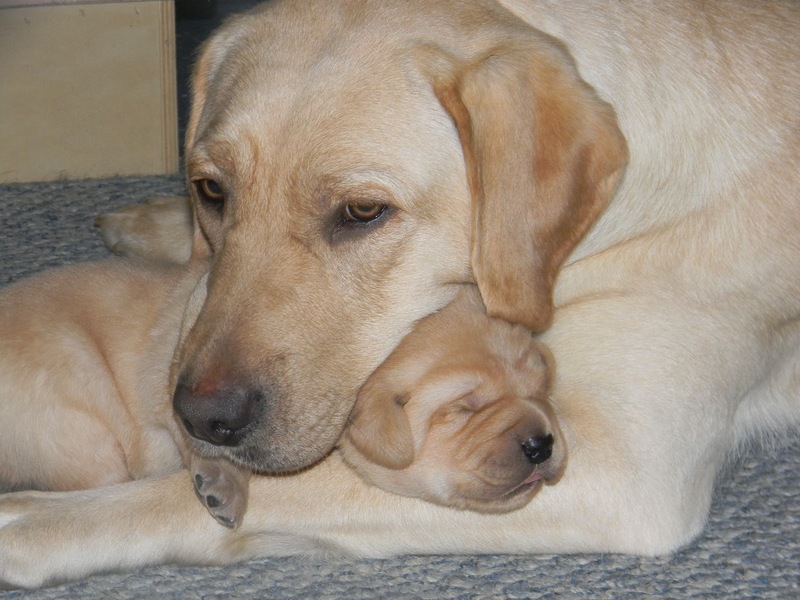 Have you heard of Assistance Dogs International? ADI is a coalition of nonprofit assistance and guide dog organizations. In order to become a member of ADI, an organization must meet certain standards and ethics for acquiring, training, and placing dogs. The members of ADI meet regularly, sharing ideas and going to workshops. Susquehanna Service Dogs is proud to be a member of ADI. 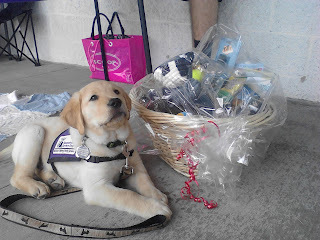 In fact, we spent July 25-29 at the Canine Science Forum and Assistance Dogs International Conference. We learned a lot about everything from better care for newborn puppies to new ways to work with children and adults as they get their service dog to how to make sure our work is effective. 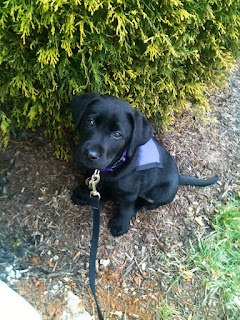 We are always open to learning something new and improving our methods of raising, training, and placing service dogs. And we enjoyed meeting with other trainers from around the world. 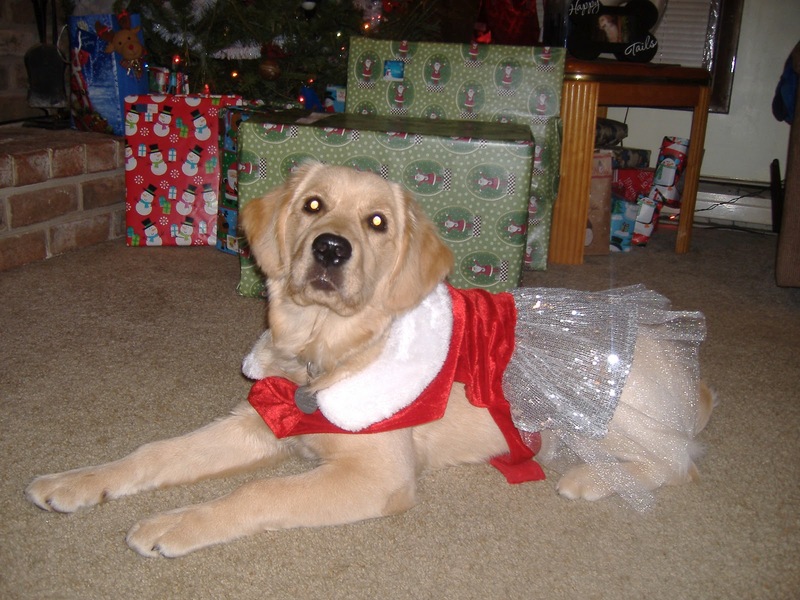 You can find other assistance dog organizations like us on the ADI website. If you’re looking for a service dog organization, we highly recommend that you use one that is fully accredited by ADI. We have worked with many of them, and they are wonderful. We hope you find the ADI website to be helpful! Twenty-two years ago today, the President signed the Americans with Disabilities Act, making it a law that people with disabilities receive equal access and protection. We certainly think this is something to celebrate! When the ADA was signed in 1990, it was a groundbreaking piece of legislation. It was the first comprehensive disability rights legislation in the United States. Watch the ADA National Network’s video on the Americans with Disabilities Act and all of the doors it has opened. For people with service dogs, the ADA guarantees their right to public access. A service dog can go anywhere that the public is normally allowed to go. This means that they can go into restaurants, movie theaters, grocery stores, gas stations, etc. Service dogs are trained to assist their partners to become more independent, and public access is the key to truly doing their job. Under the ADA, service dogs are dogs that have been trained to perform tasks for people with disabilities. For example, a dog may alert and protect a person having a seizure, alert to sounds in the environment, pick up dropped items, remind their partner to take medication, etc. The ADA also protects people’s rights and privacy. For people using service dogs, the ADA states that people can only ask if the dog is a service dog that is required because of a disability and what work or task the dog has been trained to do. People cannot ask additional questions about a person’s disability, nor can they require any sort of documentation. They also cannot ask the dog to prove it can perform those tasks. Read more about the ADA as it applies to service dogs. Although it has been 22 years since the Americans with Disabilities Act was signed, the country still has a long way to go until people with disabilities are truly treated equally. Many businesses and people don’t know about or understand the ADA. If you enter a business with your service dog and an employee asks you to leave, use it as an opportunity to educate someone about the ADA. Stay calm, smile, and explain your rights. By helping to educate people, you will continue to open doors for yourself and others. We’re looking forward to seeing the strides that are made in the next 22 years. The dogs in advanced training are getting a different type of training than they usually do. In fact, they even have different trainers. 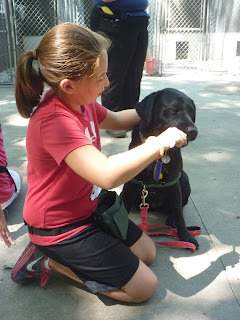 Last week and this week, the dogs are being trained by the kids in our summer camp! Each summer, 12 kids ages 10-14 come to the SSD kennel to learn about service dogs, basic dog care, and clicker training. 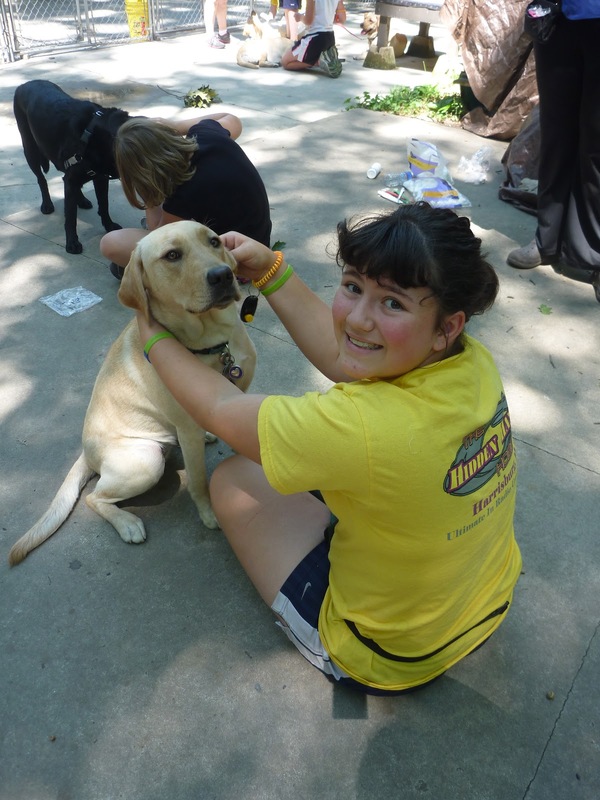 The campers are matched with a dog similarly to the way we match service dogs with their partners. 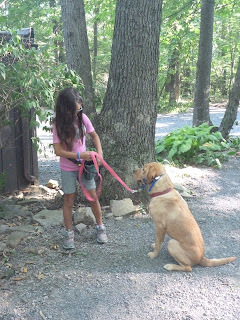 Each camper meets the dogs, and then we match them based on how the campers and dogs interact, as well as camper and dog preference. These dogs then become theirs for the week. 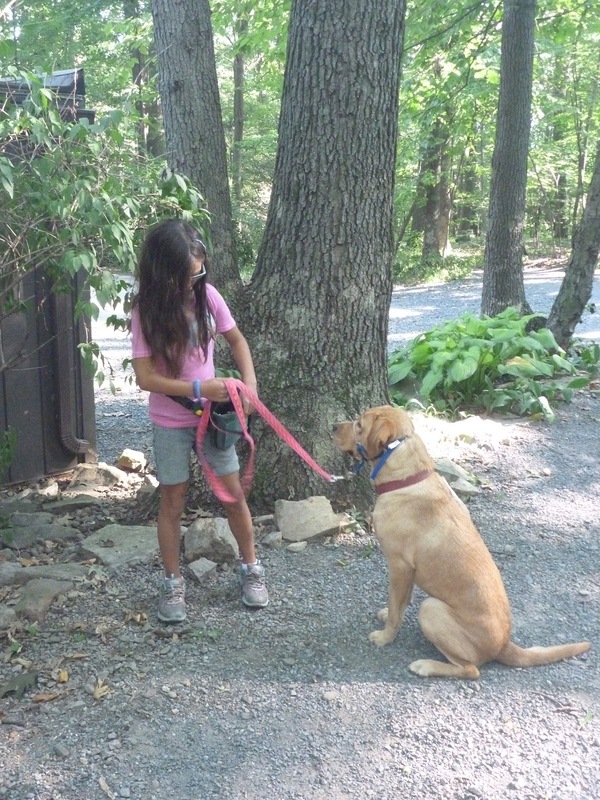 At the beginning of the week, campers select a task to teach their dog. They work on this task throughout the week, and then demonstrate it at camp graduation. By the end of the week, campers need to be ready to take the camp version of the public access test. Throughout the week, we worked on basic obedience and the behaviors the dogs will need when they go out in public. For example, the dogs practiced giving their campers their attention, sit, down, stay, go on through (going through a doorway or tight space and turning around to look at their handler), come, and leave it. They also practiced loose leash walking, leave it, entering and exiting the elevator, under (going under tables, chairs, benches), up (two paws on an object), and all the way up (all four paws on an object). 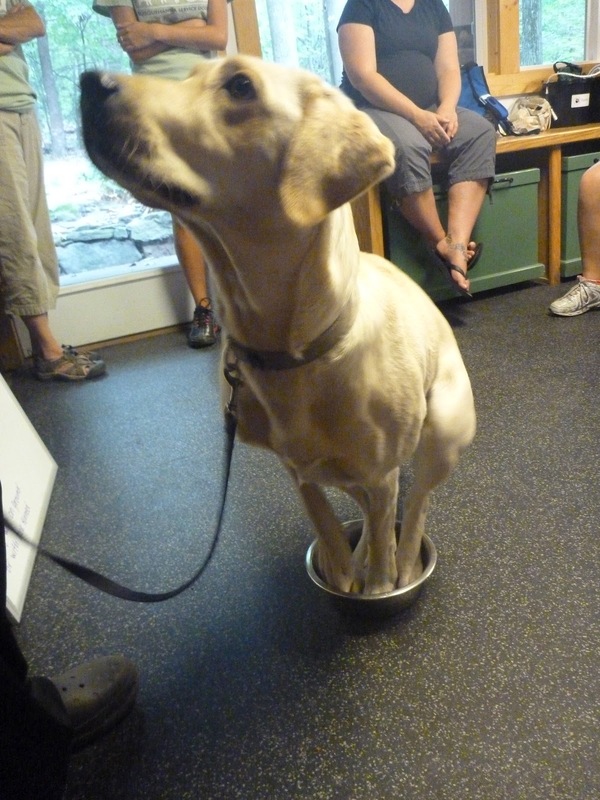 SSD Julia demonstrates "Puppy in a Box"
Throughout the week, we also played games to reinforce the campers’ clicker skills and dog handling. We set up an obstacle course for the campers to go through with their dogs. Dogs had to sit and down while their camper sat in a wheelchair, go under a chair, knock a bowling pin off a box, put two feet on a box, weave through cones, ignore a swimming pool full of treats, and go through a hula hoop. The dogs and campers did great! Other games included the Dress ‘Em Up Relay, where campers have to dress their dogs in tshirts, scarves, and socks and race to the finish line. Some of the games have to do with basic dog care, such as the Scoop the Poop game. We put Play-Doh “poop” in the field, and campers have to race to scoop it up in doggie bags. It’s a fun way to remind people to clean up after their dog. Other games include Musical Hoops, a favorite that we also play at PawsAbilities. Besides learning about dog training, campers learned about dog care. When we place a dog with a partner, we always equip them with everything they'll need to care for their dog themselves. 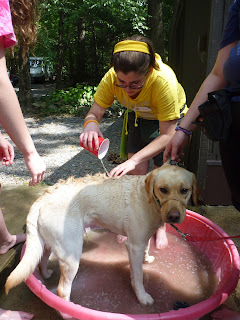 Campers learned how to brush their dog's teeth, clean ears, give the dog a bath, and of course, groom them. These are two great groups of campers. 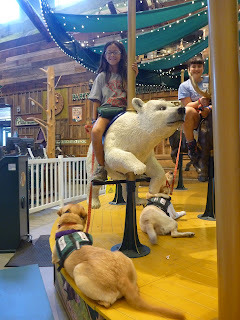 They handled their dogs with ease, and did great on their public access tests. Watch the videos of some of our campers taking the test. SSD Atari goes under a bench. SSD Samee Mae enters the elevator. SSD Dyson exits the elevator. SSD Meade puts his paws on the checkout counter on cue. SSD Julia comes when called. SSD Cassie trots over to her camper on cue. She even picks up her leash! 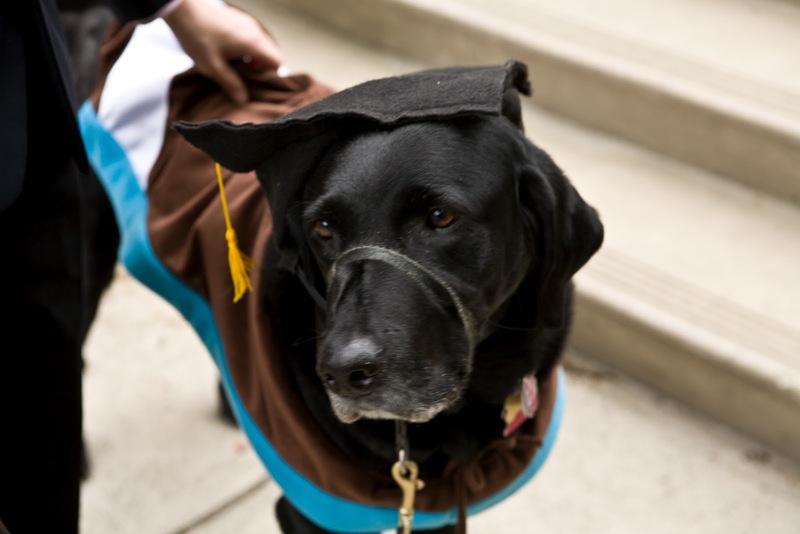 SSD Meade has been in advanced training for a little while, and now he’s about to take on a new job. Meade has become our newest breeding dog. 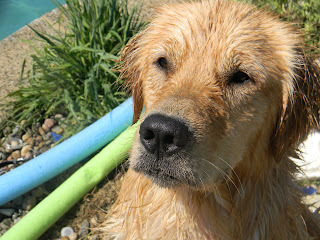 He joins our five other breeding dogs: SSD Fire, SSD Kirby, SSD Midge, SSD Opal, and SSD Scotia. We breed dogs to become service dogs because all of our dogs must have a certain temperament and pass specific health exams in order to be placed with a partner as a working service dog. Please read “Why We BreedService Dogs” for more details about our decision to breed dogs for service work. The decision for a dog to become a breeding dog is not taken lightly. We look at the entire history of the dog, starting with their 8-week temperament test. We look at the dog’s behavior in puppy class, their 12-month evaluation, and their time in advanced training. The dog must have excellent bone structure and eye health. We also do genetic testing on all of our breeding dogs to make sure they aren’t carriers of certain diseases that could shorten the working life of a service dog or even prevent them from becoming a service dog. 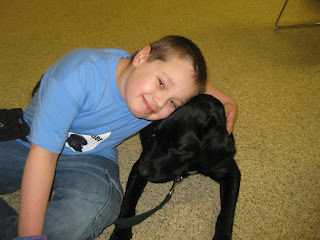 Our goal is to make sure that each service dog we place is able to meet their partner’s needs for many years. 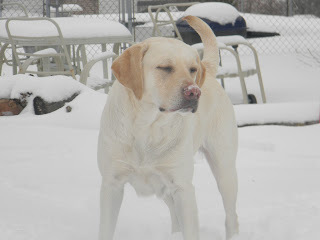 Meade was selected as a stud because we think he will pass some nice traits to his puppies. 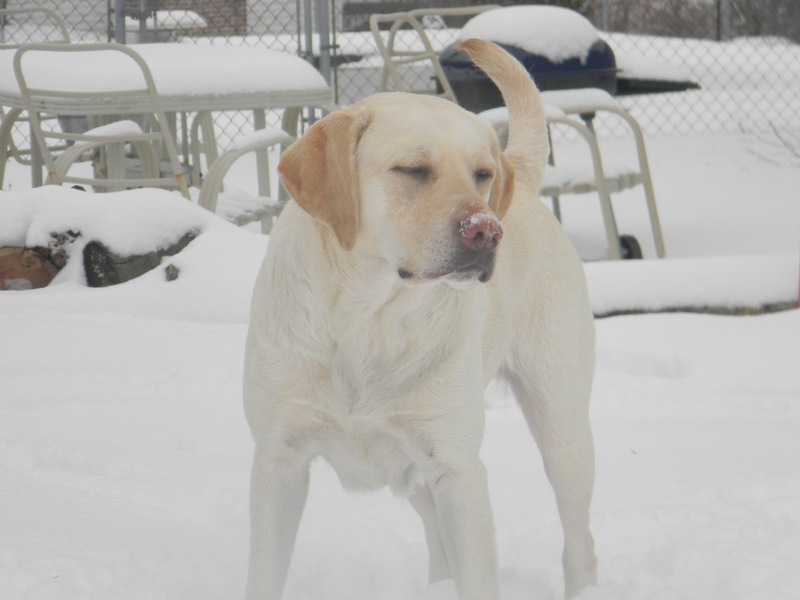 Although Meade is not a perfect dog, he has some traits that are important for service dog work and our program. He is a big dog, and we’re hoping he will produce some big puppies. The size of a service dog doesn’t matter for many tasks, but there is one task where size is extremely important: balance work. The size of the dog does matter when he is acting as a counterbalance to assist someone to walk. 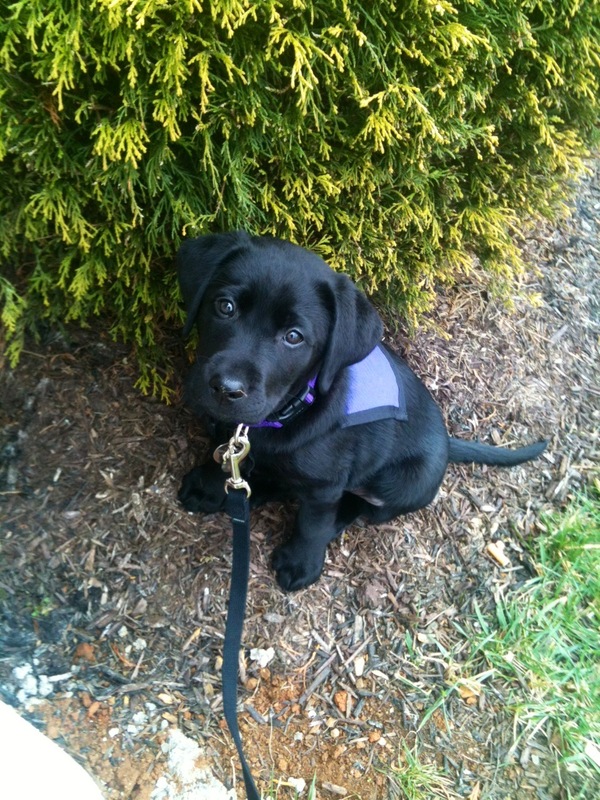 Meade also displays no harness sensitivity, so he has no problem wearing his service dog harness. Although it’s not required by the ADA, the service dog harness clearly identifies a dog as a service dog. Also, a dog with harness sensitivity is limited in the jobs he can do. For example, a dog with harness sensitivity could not become a balance dog because he would not be able to tolerate the special harness that balance dogs must wear to assist their partners. Another trait that we like is Meade’s ability to get along with other dogs. In their line of work, service dogs will inevitably come in contact with other dogs, and they must be able to interact well and still remain focused on their partner. Meade has done very well with strange dogs since he was a puppy. 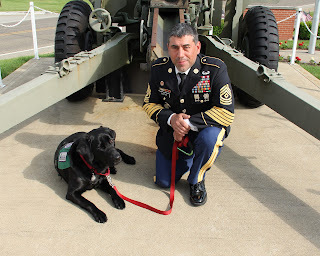 For example, when he was 8 weeks old, he and his littermates were given a temperament test to see if service dog work would be a good match for them. As part of that test, the puppies were introduced to a strange dog. When it was Meade’s turn, he interacted very nicely with the other dog. He acted like a playful puppy, but he also paid attention to the other dog’s signals, and when the dog signaled that he wasn’t happy with something Meade was doing, Meade respected that. Other traits we look for in our breeding dogs are confidence and empathy. Confident dogs will be able to handle the stress of being a service dog. They will be able to relax and easily adapt to different situations. If a dog tends to get worried, they may become stressed when their partner gets upset or has a rough day, and then they will not be able to assist their partner. Empathetic dogs do very well with children with autism and people with psychiatric disabilities. These dogs often seem to know what their partner needs before their partner even knows. Meade is the son of SSD Sweet William, our founding stud. We are excited to see what kind of puppies he has. The votes are in! Thank you to everyone who voted for their favorite photo for the 2013 SSD calendar. We know that some of you had difficulty casting a vote, and we thank you for your patience and perseverance. The 2013 calendar will be on sale in the fall. We'll send out more information then. For Americans, the 4th of July often includes backyard cookouts, relaxing in lawn chairs with family and friends, games of bean bags, baseball and volleyball, and of course, fireworks. And what outdoor celebration would be complete without our canine pals? Although we may want our dogs to enjoy the 4th of July with us, there are many hidden (and some not so hidden) dangers to watch out for during the national holiday. Here are 9 tips to help you make sure that your dog stays safe this Independence Day. Give your dog plenty of exercise well before the fireworks start. A tired dog is more likely to remain calm than a dog full of energy is. Take your dog for a nice, long walk in the early morning or evening (or both!). Play in the yard or do some training sessions. Whatever works to let your dog release pent up energy. Make sure your dog is wearing a collar and ID tags. We're going to say that again. Make sure your dog is wearing a collar and ID tags. The humane society receives more runaway and stray dogs around the 4th of July than any other time of the year. Don't leave your dog unattended in the yard (or car). Even if your yard is fenced in or your dog is tethered, dogs have still been known to escape. Dogs that don't like fireworks have been known to chew through leashes, doors and fences in an effort to escape the noise of fireworks. Even if your dog isn't afraid of fireworks, your dog could still escape amid the commotion of a picnic. Give your dog a safe haven. Give your dog a safe place to stay during the fireworks if they don't like them. This safe haven should be inside and may be a small, comfortable, enclosed space. If your dog is crate trained, a crate could work nicely. Close the curtains, turn on the TV or radio, and turn on the lights. By closing the curtains and turning on some benign noise and light, the sight and sound of the fireworks will be muffled and hopefully cause your dog less distress. Don't sooth or baby your dog. While your instinct may be to sooth, comfort, and baby your dog when they start acting anxious or stressed during fireworks, try to resist it. You could actually make the behavior worse. After all, if you praise and pet your dog during your training sessions wen they do something good, what do you think will happen when you give your dog that same comforting praise and petting when they're displaying anxious behavior? You will reinforce it. Instead, stay calm and cheerful. Try to distract your dog with games or treats. You may be able to distract your dog from the fireworks by playing a low key game inside. You can also try giving your dog some delicious treats, like a frozen marrow bone or a treat-stuffed toy. High-caliber treats like this may hold your dog's attention so they don't notice the noise from the fireworks as much. Make sure you have your dog's medications available. If your dog takes medication to get through fireworks, make sure you have some on hand before the holiday. We wish you and your dog a happy and safe 4th of July!